My husband and I are looking for organization/storage ideas for a 20ft yurt. It is just us and our dog. We will be living in this for about a year while we build our house, then it will become a workshop. We'll basically be camping. There won't be running water, but we have a well w/ hose on site. We will be using a composting toilet set up in a separate small "outhouse" building. We will have a woodstove and cookstove as well as a small chest fridge. We do have interior wall paneling that covers the lattice, so that may make it a bit more challenging to hang things on the walls. Anyhow, any tips/tricks/ideas that folks might share with us in efficient ways to store food, cooking items, clothing, pet stuff, etc. would be great! I've been checking online for ideas from "small spaces" and tiny homes, but thought I'd see what folks here are doing. I have two chest freezers (one converted to a fridge). I've been meaning to build a frame with a shelf above them for light/bulky storage, but there seems to be enough (cluttered) space already. Re: water. I used just a hose w/a faucet adapter initially for a kitchen sink (doesn't work when it's freezing outside). Now I have a 6.5 gal carboy I pump up into that siphon drains through a valve into my sink. Very handy. It can be challenging, especially with that gigantic round wall as nothing sits square against it. I found that you have to get used to using space under things. For example, the bed, the couch, the yurt itself, etc..
A tall bed is a great idea, but we went with a futon that will work for bed and couch. The futon frame is high enough (we built it that way) that we can slide some low plastic storage containers beneath it (may end up containing the bedding we use at night). We have an 8cuft Sundanzer chest fridge and will not be puttting in a freezer. My husband telecommutes, so has to have a standing desk setup for work (so we can store some of his work things under that). Do any of you hang clothing? I've been wondering about hanging a bar from rope from the rafters to hang some clothing on. We also have two hanging "shoe" organizers that we've used for organizing our biking gear and/or winter gloves/hats/etc - those could be hung against a wall from the rafters I would think. I like the idea of a water jug in the kitchen area that has a spout and that's what I figured we'd have. We'll have a bucket below a sink for the kitchen, too - basic stuff. We have a bunch of plastic three draw organizers (the taller variety) that can be stacked. I think we'll need to make liberal use of them. My husband doesn't like the looks of them, but I think he's just going to have to deal with it until the house is built. Hierony, could you share a picture of your carboy setup? We have a couple of carboys and maybe your setup is a better way to go for us. Here's two photos of the glass carboy & sink (phase I & phase II). There's a pump that takes the water from the bucket, up the vinyl tubing into a check valve into the copper tubing behind the sink. I've since put the tee closer to the carboy, with the potential for water filters lower down; needs a drain valve for absences during freezing weather. 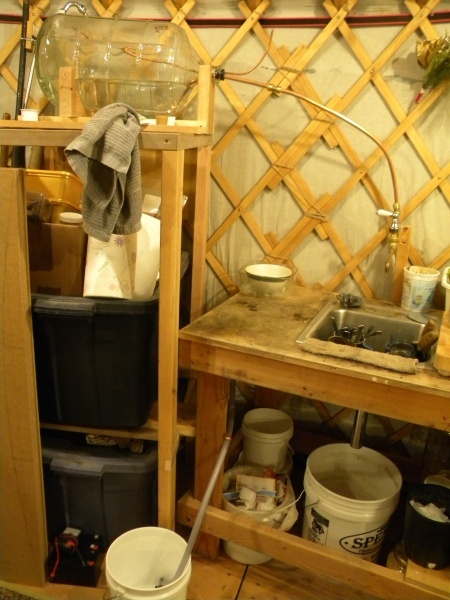 I added two shelves to the water tower/grain bin holder, and built a much nicer sink bench. I want to get around to putting a backsplash on the sink bench--then I could have a shallow shelves & such for spices/dishes/utensils. 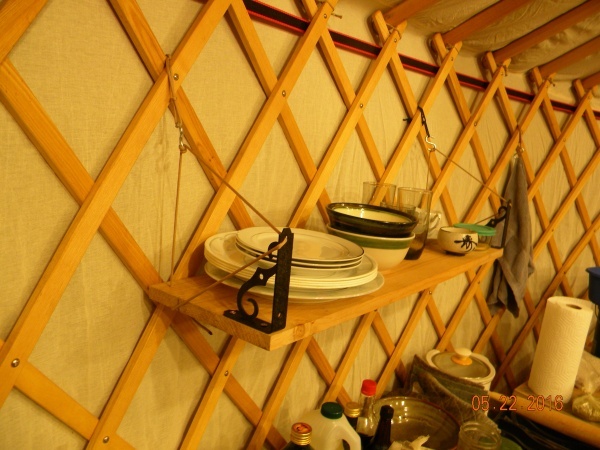 My traditional-style yurt roof poles work nicely for hanging clothes up on (just a few dress shirts & suits). Oddly enough, I also use my bed as paper/laptop space--almost a standing desk, right? I've seen those hanging shoe holders coupled with small cardboard boxes (hospital supply boxes?) used as organizers, to good effect. But those sorts of things always end up breaking on me--you're luck may be better. Hope that gives you some ideas! Oh, I also have a 6 ft sapling staff that I put through the crown ring support posts (not usually present in modern-style yurts). I use it for drying towels or laundry on clothes hangars and such. Hierony, have you ever had items on that wall shelf walk off in a high wind? With the three ropes around the belly and a cinch strap around the base, the walls don't really vibrate in wind. Sometimes the urgh/ring cover will jump up to alleviate pressure differences or some poorly-implemented covering tarps will flap, but even during a small earthquake two summers ago the wall shelf stuff doesn't vibrate off. I knew they would stay put in the wind. 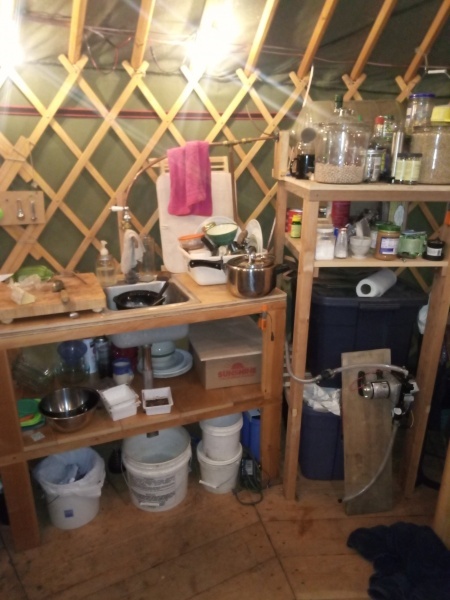 I asked the questions so you could illustrate for and those unfamiliar with yurts just how solid yurts really are.With all the redundancy in a yurt wall and roof frame, and the round shape, yurts are the absolute pinnacle of tent design.